So many questions, so little prime time. 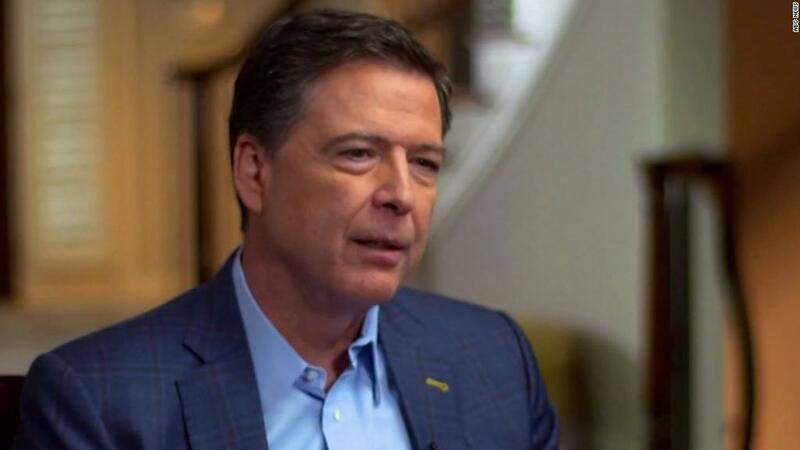 If ABC News' Sunday night special about James Comey felt condensed, that's because nearly five hours of interview was compressed into an hour-long program. It was a difficult task for the producers and editors -- but they conveyed Comey's complex decision-making as FBI director and his complicated feelings about President Donald Trump, who fired him last May. ABC chief anchor George Stephanopoulos had the scoop -- the very first interview with Comey. It was recorded last Monday at Comey's home in suburban Washington. While there are still some unanswered questions, of course, ABC's Sunday night telecast told the Comey tale from start to finish. It was, without a doubt, one of the most anticipated interviews of the year. "No FBI director has ever played such a consequential role in a presidential election. No FBI director has ever been fired as he was investigating a president," Stephanopoulos told CNNMoney. What did Stephanopoulos hope viewers would take away from the interview? "After tonight, I hope people know more about what James Comey has been thinking and feeling since that day," he said. "I tried to ask the most critical questions about the critical decisions he made." Stephanopoulos will interview Comey again Tuesday, live on ABC's morning show, "GMA." That's the day Comey's book, "A Higher Loyalty," officially comes out. Macmillan, the publishing house behind the book, has ordered an initial print run of 850,000 copies, expecting super-charged sales. ABC producers and editors worked for several days to highlight the best parts of the interview for their prime-time special. The edit was finally "locked," or finished, early Sunday afternoon. In one highlight, Stephanopoulos said: "You write that President Trump is unethical, untethered to the truth. Is Donald Trump unfit to be president?" Comey responded: "Yes. But not in the way I often hear people talk about it. I don't buy this stuff about him being mentally incompetent or early stages of dementia. He strikes me as a person of above average intelligence who's tracking conversations and knows what's going on. I don't think he's medically unfit to be president. I think he's morally unfit to be president." ABC published the full transcript of the interview on its website. Lots of others are set to follow. After appearances on "GMA," NPR's "Morning Edition," and "The Late Show with Stephen Colbert" on Tuesday, Comey will appear on ABC's "The View" on Wednesday. His first cable news interview will be on "The Lead with Jake Tapper" on CNN on Thursday afternoon. Speaking on Sunday's "Reliable Sources" on CNN, former presidential adviser David Gergen said that Comey "can be a showboat. But he added that Comey "speaks from a deep ethical place, and he's saying some things that he thinks the country needs to say and needs to hear." Gergen said Comey's book could "change the narrative" about the Trump presidency. "It's been really hard to put all the pieces together in our minds about, 'How does this all add up?'" he said. "Comey comes along and says, 'This reminds me of prosecuting the mob and essentially a mob boss that I'm having to deal with.'" Gergen added, "If that becomes the narrative, sort of the dominant narrative, that's going to affect our politics, it's going to affect the way historians see this." A version of this article first appeared in the "Reliable Sources" newsletter. Sign up here.